Launch day conjures up a special level of excitement for gamers, and each of us has their own story that they associate with the launch of a new console or a particularly anticipated new game. The Xbox 360 launch holds an especially dear place in my memories, and I'm going to share a bit of what my experience was. On May 12, 2005 I eagerly watched with awe as Microsoft announced Xbox 360 on MTV, soaking in every last detail about this new system. My entire gaming life until that point had exclusively been with Nintendo platforms, and at 12 years old I was ready to take my first steps into what I saw as the cooler and more mature world outside of Nintendo. I had been in awe of Halo 2 the previous year, and swore to myself that I didn't want to miss out on games like that in the future. When Xbox 360 was announced, my honed pre-teen instincts told me that this was the console for me. Importantly to my family, Microsoft announced that Xbox 360 would be featuring a graphics processor from ATI, as this was a necessary condition for whichever console I would buy. Combined with the lure of Halo as well as the lower-price tag and early release date, this was the console for me. For the first time after having a paper route, I had the means to save up for the console I wanted and over the next number of months, that's exactly what I did. In August of 2005, word reached me that Xbox 360 was expected to be supply constrained, and I quickly convinced my mom to take me to my local Toys R Us to preorder the Pro bundle. I had guessed that they would still have preorders available because less people went to them for games compared to EB Games, and I was correct. My wait until November 22nd began, and as I saved up the $499.99 needed to buy it, I soaked in every bit of information on the system that I could. I couldn't wait. November 22nd arrived, and all I could think about that day at school was if someone was going to pick up my Xbox, I was extremely worried that there would not be enough consoles to cover my preorder. When I got home, to my utter surprise it was sitting on my desk waiting for me. My mom had gone to pick it up in the morning, and with great care I opened it up. I can't recall ever being more excited for anything in my life, and my dad soon arrived home with my copy of Perfect Dark Zero and an extra controller. Much to my surprise, he bought me a copy of PGR 3, and helped me set up the console. The total cost to me including taxes was $712.96, nearly all the money in my bank account at the time. But when I turned on the console and played that first level of Perfect Dark, it was all worth it. I was in awe of this console and was extremely impressed that I one of 2 kids who had the console in my grade. Needless to say, I looked forward every day to coming home to play this console, with Perfect Dark being my personal favourite to play until I bought Ghost Recon Advanced Warfighter and The Outfit the next spring, and finally in fall of 2006 the game I had been waiting for, NHL 07. 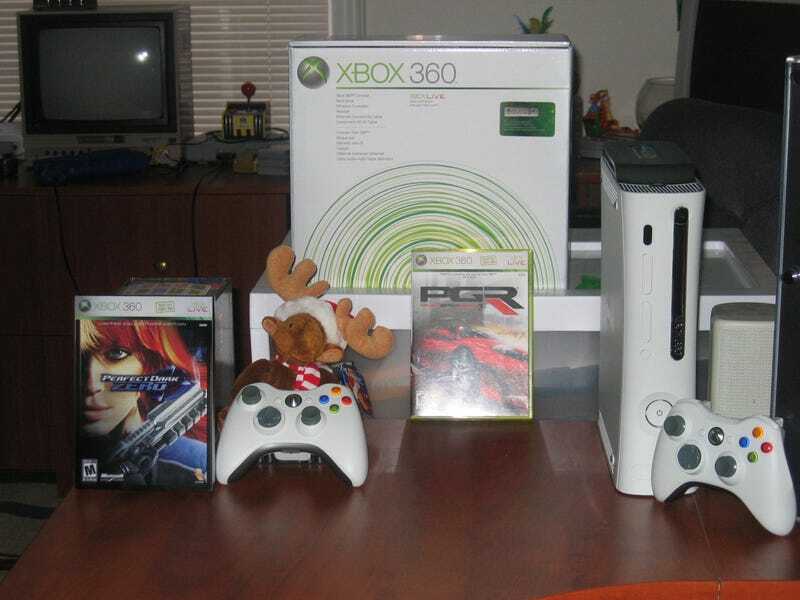 Overall, the Xbox 360 launch was one of the most memorable events of my childhood, and my first experience actually buying something of that cost by myself. I still remember those events vividly to this day, I still smile at the sheer wonder and excitement this console made me feel as a 12 year old. Check out my other work at mdubs-tep.